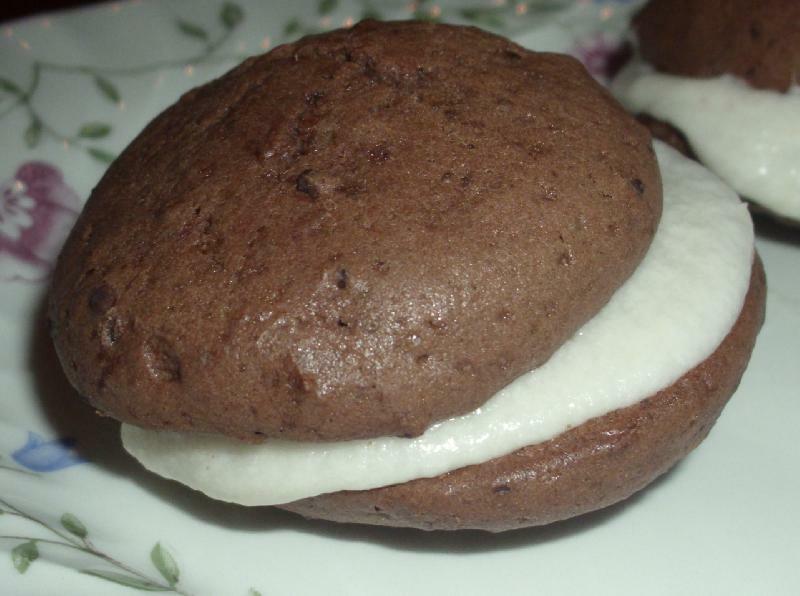 As a kid I grew up in Maine where whoopie pies are quite common. 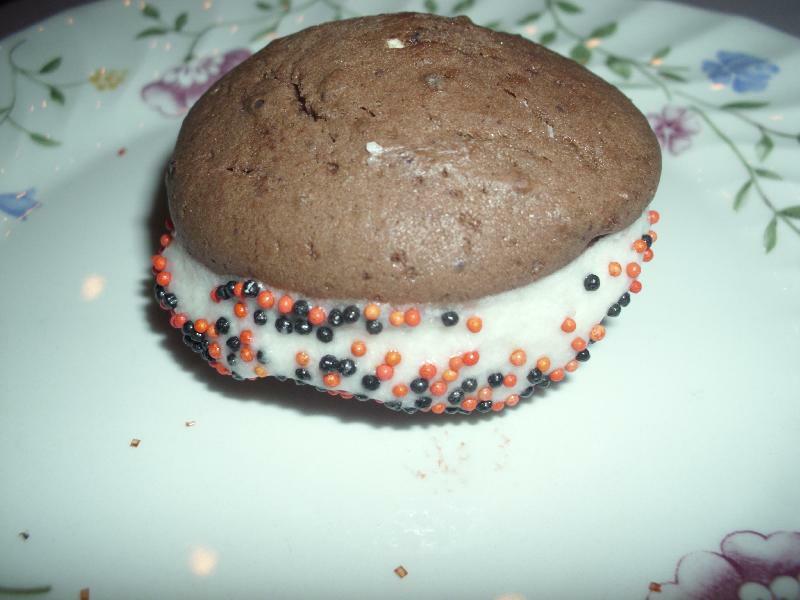 I loved the whoopie pies that the school cafeteria would sell at Westbrook Junior High School. Yes I know something yummy from a school cafeteria sounds like it doesn't exist but they were so good. I made these hoping they would remind me of those delicious treats. I found this recipe in the October 17, 2011 issue of Family Circle magazine on page 113. It can also be found here. 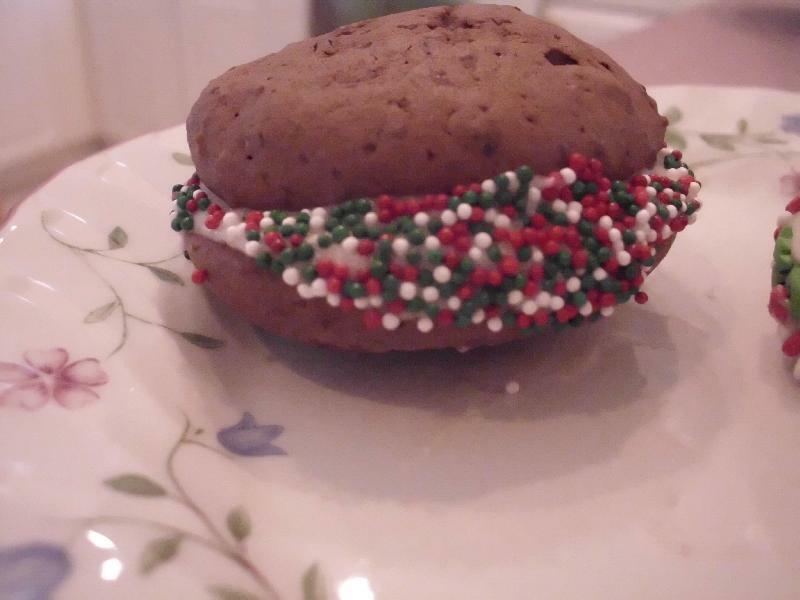 I decorated some of the whoopie pies with sprinkles for different holidays. I found the frosting very thin and that the whoopie pies slid off of each other. I would add more conf. sugar next time to make it thicker. I would probably also double the frosting recipe as I felt it didn't make much frosting to put on the whoopie pies. 2. Line 2 or 3 large baking sheets with a nonstick foil. 3. In a medium size bowl, whisk flour, cocoa, baking powder, and salt. 4. In a large bowl, beat together the butter and sugar until smooth. 5. Beat in the eggs, one at a time, beating well after each one, until the mixture is a pale yellow color. 6. On a low speed, beat in half of the flour mixture. Beat in the milk and vanilla and then the remaining four mixture. 8. Bake for 12 to 13 minutes or until the tops are dry. Cool completely. 9. Meanwhile prepare the filling. In a medium sized bowl, beat together the sugar, butter, two tablespoons of water, vanilla, and food coloring until the frosting is smooth and has achieved the desired color. 10. Once the cookies are cool, sandwich together with a tablespoon of filling. kml9876 : I fixed the printing issue. Sorry about that. kml9876 : Thank you. I will try to get the printing issue resolved. anonymous : When I tried to print out your whoopie pie recipe, their was a lot of trash mixed in. And the Family Circle website does not allow me to enter even though I am a member.